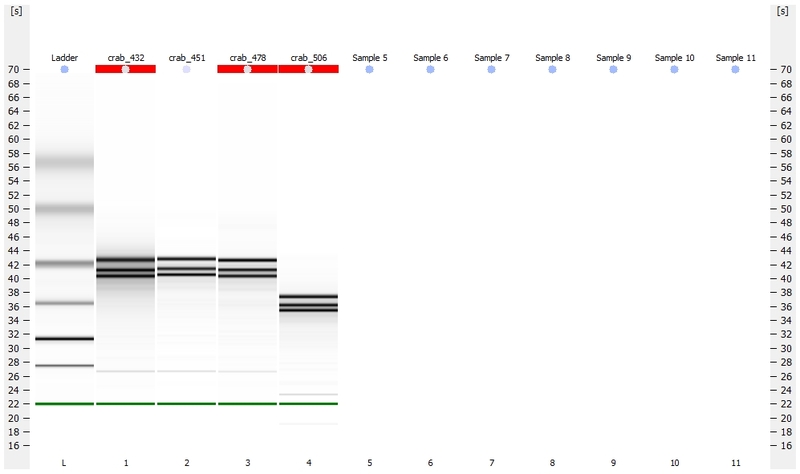 In preparation for MBD enrichment, fragmented Olympia oyster gDNA with a target size of ~350bp. 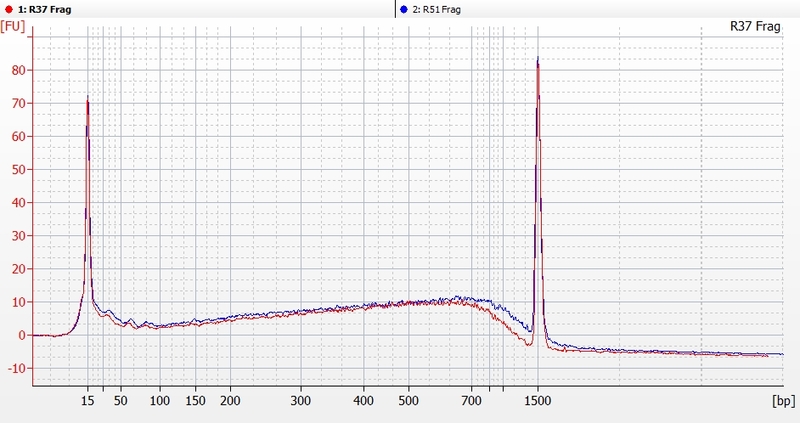 Used the Seeb Lab’s Bioruptor 300 (Diagenode) sonicator. This entry was posted in Olympia oyster reciprocal transplant and tagged bioanalyzer, Bioruptor 300, electropherogram, Hood Canal, olympia oyster, Ostrea lurida, Oyster Bay on 19 November, 2015 by kubu4. This entry was posted in Protein expression profiles during sexual maturation in Geoduck and tagged bioanalyzer, DNased RNA, electropherogram, gel, geoduck, gonad, NanoDrop1000, Panopea generosa on 28 May, 2015 by kubu4. 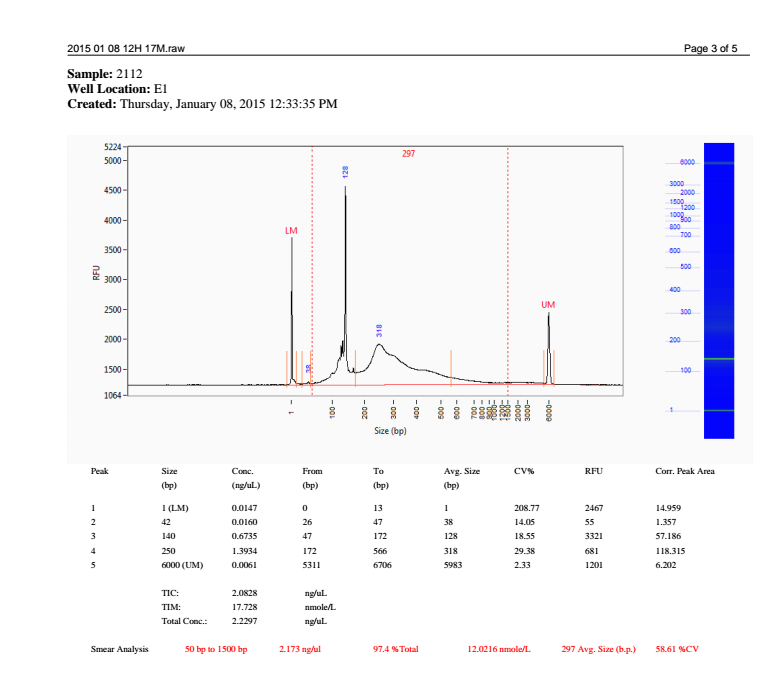 I received the Bioanalyzer data back for the geoduck foot RNA samples I submitted 20150422. The two samples were run on the RNA Pico chip assay. Data file requires 2100_Expert_B0208_SI648_SR2 version of the software (Windows). The samples look really good! 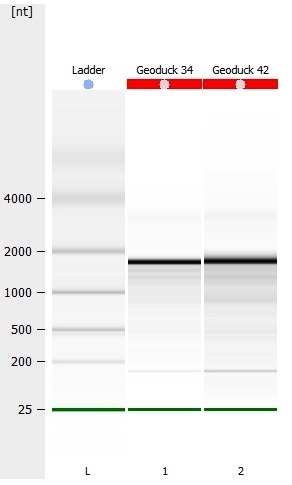 As we’ve seen previously in shellfish RNA, there is a single, prominent rRNA band/peak with very little degradation (smearing and/or no prominent peak/band). Will proceed with RNA isolation from the remaining histology blocks. This entry was posted in Protein expression profiles during sexual maturation in Geoduck and tagged bioanalyzer, electropherogram, foot, gel, geoduck, Panopea generosa, RNA, RNA Pico on 24 April, 2015 by kubu4. To complement MBD ChiP-seq data and RNA-seq data that we have from this experiment, we want to generate, at a minimum, some BS-seq data from the same C.gigas individuals used for the other aspects of this experiment. Claire had previously isolated DNA and sheared the DNA on 20140108. If possible, we’d like to perform MBD enrichment, but the current quantities of DNA may prevent us from this. 2100 Bioanalyzer electropherograms of Claire’s sheared C.gigas DNA. Claire’s notebook entry doesn’t ever specify what her target shear size was, but the Bioanalyzer analysis suggests an average size of ~500bp. Also interesting to note is that Claire’s sample concentrations (as measured on the NanoDrop1000) are significantly greater than what is calculated by the Bioanalyzer. 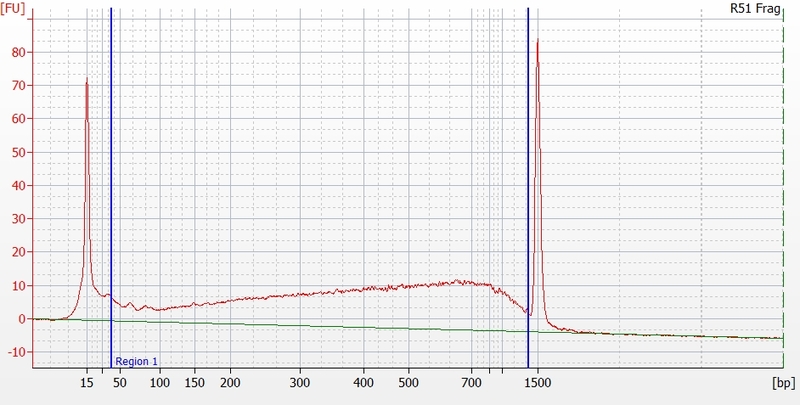 Since the Bioanalyzer chip used (DNA1000) only goes to 1000bp, is it possible the differences in concentrations is due to incomplete shearing of the samples (e.g. a significant portion of the DNA is >1000bp in size and thus not factored in to the Bioanlyzer concentrations calculations)? Will check sample volumes and determine total amount of remaining DNA for each sample and then assess how to proceed next (i.e. MBD or just BS-seq). Sample volumes were measured and total quantity (ng) of DNA in each sample were added to the spreadsheet above. Based on the quantities of DNA we have for each sample, will discuss sequencing options (e.g. MBD or not, self-prepare libraries or not, etc) with Steven. This entry was posted in Lineage-specific DNA methylation patterns in developing oysters and tagged bioanalyzer, Crassostrea gigas, DNA, DNA1000, electropherogram, heat shock, mantle, Pacific oyster, spreadsheet on 20 February, 2015 by kubu4. This is a problem because such a high quantity of adaptor sequence will result in the majority of reads coming off the Illumina being just adaptor sequences. 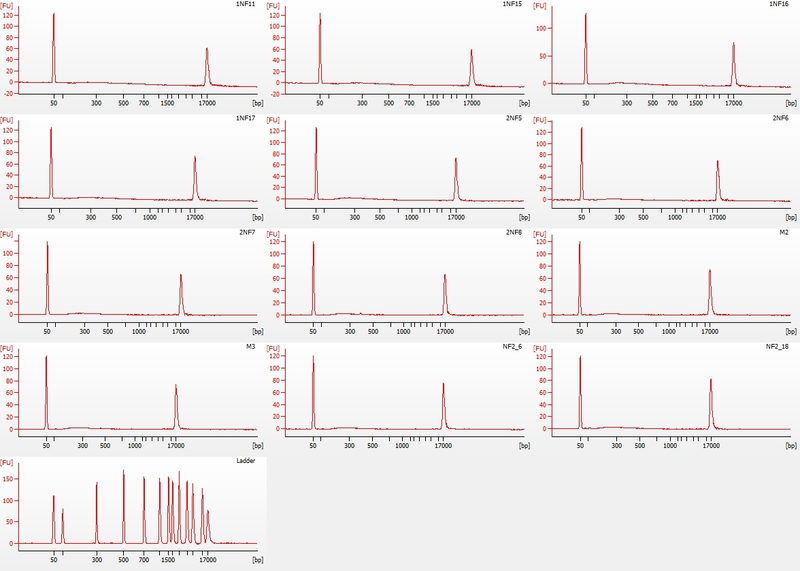 After clean up, quantified the sample via fluorescence using the Quant-iT DNA BR Kit (Life Technologies/Invitrogen). Used 1uL of the sample and the standards. All standards were run in duplicate and read on a FLx800 plate reader (BioTek). Brought the entire sample up to 20uL with Buffer EB (Qiagen) and a final concentration of 0.1% Tween-20 (required by the sequencing facility). Sent sample to the University of Oregon to replace our previous submission. This entry was posted in LSU C.virginica Oil Spill MBD BS Sequencing and tagged bioanalyzer, Crassostrea virginica, DNA Quantification, Eastern oyster, electropherogram, library prep on 22 January, 2015 by kubu4. 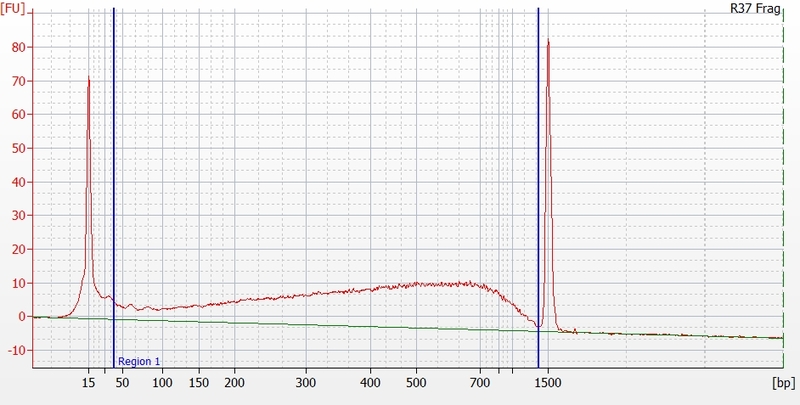 To gain a more quantitative assessment of the fragmentation from 20100625, I ran 1uL of each sample (~55ng, according to pre-fragmentation spec values) on the Agilent Bioanalyzer 2100, using the DNA 1000 kit, according to manufacturer’s protocol. Avg. size of fragmentation is ~460bp for the two samples. Fragmentation size was determined by marking the same region on both sample’s electropherograms (see below). Overlay of R37 and R51 fragmentation. Note that both electropherograms are nearly identical (this is good). This entry was posted in Miscellaneous and tagged bioanalyzer, Crassostrea gigas, DNA1000, electropherogram, Pacific oyster, R37, R51 on 30 June, 2010 by kubu4.